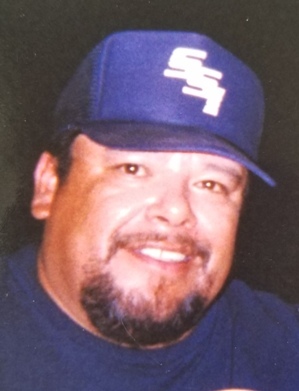 Reynaldo “Rey” Reyna, Sr, 58 of Fremont, OH passed away Sunday, September 3, 2017 at Bethesda Care Center. He was born on July 23, 1959 in Fremont, OH to Enestacio and Olivia (Herrera) Reyna. Rey was a 1977 graduate of Fremont Ross High School. Rey married Marylou Arriaga on September 6, 1980 in Green Springs, OH and she survives. He worked for Fremont Plastics as a forklift operator for many years. Rey was a member of St. Joseph Catholic Church. He enjoyed cooking out, cutting the grass, playing horse shoes, spending time with his family and was an avid Cleveland Browns fan. Rey is survived by his wife of thirty-seven years, Marylou Reyna, Fremont, OH; children, Reynaldo (Autumn) Reyna, Jr, Fremont, OH, Amanda Reyna, Fort Wayne, IN; siblings, Luis (Alicia) Reyna, Sr, Fremont, OH, Alberto (Bonita) Reyna, Eaton, OH, Arty Reyna, Fremont, OH, Jose “Junior” (Sara) Reyna, Burgoon, OH, Erminia (Mondo) Calderon, Bowling Green, OH; grandchildren, Alandrae Parks, Aubreyana Reyna and Reynaldo Reyna, III. Visitation: Thursday from 2 to 4 p.m. and 6 to 8 p.m. with a vigil service at 7:30 p.m. at Wonderly Horvath Hanes Funeral Home and Crematory, 425 E. State St, Fremont, OH. Mass of Christian Burial: Friday, September 8, 2017, 10:30 a.m. at St. Ann Catholic Church, 1021 W. State St, Fremont, OH with Fr. Michael Roemmele officiating. Memorials can be made in honor of Rey to Fremont Dialysis Renal Care or the Kidney Foundation for Cancer. Offer Condolences for the family of Reynaldo “Rey” Reyna, Sr.
We Will All Miss You Uncle Rey!! Go Browns!! I am so sorry to your whole family for your loss. I know your hearts ache…prayers are lifted for all of you. Mary Lou my deepest condolences to you And your family, may God give you strength and wisdom to understand his WILL may he bless you in this next hard days to come. I am so sorry for your loss. My prayers and thoughts are eith your family. RIP MY Friend. I am glad you are no longer in pain. Our Deepest Condolences to Amanda, Marylou Reyna y all their Family. Sending lots prayers and blessings. Mary Lou, my sincere condolences for your loss. Although we are far in distance, our hearts are forever connected in love as family. Will continue to pray for you and your family as well as my cousin’s siblings and extended families. Prayers that you will find comfort and peace in the arms of Jesus, your Lord and Savior. Blessings to you all! I extend my deepest sympathies to you and your family. May the soul of your husband be at peace with our Heavenly father. Our deepest sympathy for the Reyna family. .may he rest in heaven. Mary Lou, may God guide you through the lost of your loving husband. Rey is in God’s hand, his body has been restore as he made his way to God. One day you will be reunited with him. Prayers for you and your family. May God give you the strength to you and your family. I know there are no words that will take away your pain of losing the love of your life. I will keep you in my prayers mija. To the family of Reynaldo Rey Reyna, at this time I share in your loss of your husband, father, grandfather and my friend. Lady Cynthia and I lift you up in prayers as you go through these sorrowful days. May the Lord be with you. Marylou I’m do very sorry for what you are going through right now let our lord and Savior give you the peace and understanding and love that you will need at this time in your life. My condolences to the whole family you will all need each other now more then ever. I knew Rey when he was just a young little kid. Our families were quite close/ neighbors. My condolences to his wife, children, grandchildren and siblings. RIP Rey . I am so sorry for the reyna family loss rey was a great guy I remember him growing up in Fremont . My condolences from my father Roberto Bustos ,Richard and my self Lucy Bustos Santiago . So sorry to hear of your husbands passing. You and your family are in my prayers. Sending you prayers, Mary Lou and family.